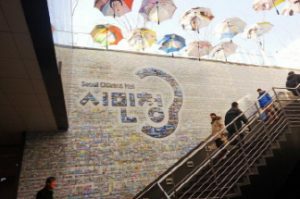 “Seoul City Walking Tours” is a free program offered by the city of Seoul designed for tourists who want to see Seoul’s top tourist attractions on foot under the expert guidance of multilingual tour guides. Reservations for this program can be made via the internet and mobile web at dobo.visitseoul.net. The Seoul City Tour Bus offers organized shuttle tours of the city’s most popular and noteworthy attractions through circular routes. With one ticket valid for the day, tourists may hop-on and –off at any of its destinations to visit the attractions of their choice (except for the nighttime tours which are non-stop). Available Courses are: Seoul City Course (City Circulation, Cheonggyecheong Stream, Seoul Panorama, and Nighttime Tours I & II), Traditional Culture Tour, and Gangnam Tour. The little green Jongno 11 bus is more than just a good way to get from Gwanghwamun to Seoul Station. By an accident of transportation planning, it’s a veritable sightseeing bus that you through the very heart of old Hanseong, as Seoul was called when it was the royal capital of the Joseon Dynasty. Plenty has changed over the last century, of course, but the coexistence of the old and new is what gives Seoul its characteristic tension and charm. Myeong-dong is Seoul’s shopping mecca and is a must-see for tourists, but it is not just a shopping destination; Myeong-dong is also a center of commerce, banking and culture with a daytime population of 1.5-2 million. 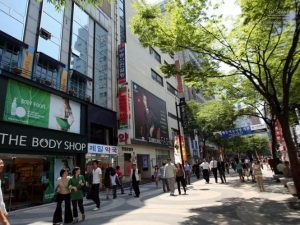 For shoppers there is a mixture of street stalls and retail outlets selling everything from high fashion to casual attire as well as many Korean cosmetics stores offering high-quality products at competitive prices. Myeong-dong is very popular with international visitors and fills with Japanese tourists during the Japanese holiday period known as “Golden Week” which runs from the end of April to the beginning of May. 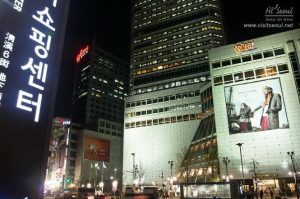 Part of Myeong-dong’s popularity stems from the more affordable prices here compared to Apgujeong-dong and Cheongdam-dong. Dongdaemun Market is a large commercial district comprised of traditional markets and shopping centers that covers the entire area around Dongdaemun (Gate), a prominent landmark in Korea. 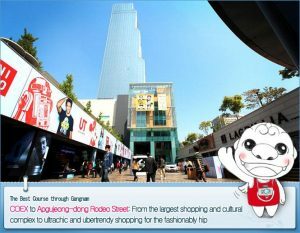 It is Korea’s largest wholesale and retail shopping district featuring 26 shopping malls, 30,000 speciality shops, and 50,000 manufacturers. All kinds of goods can be found here including silks and fabric, clothes, shoes and accessories, electronics, leather goods, sporting goods, office supplies, pet products and toys. Nowhere exudes more local and traditional charm than Insadong, a quaint neighborhood in the center of Seoul that transports visitors back to a time when women wore hanbok and men rode horses. With its wooden tea houses, boutique galleries and street vendors selling traditional snacks, a stroll through Insadong is mandatory for all visitors, especially on Sundays when the streets become traffic free and come alive with street performances, buskers and throngs of young and old who have come to experience one of Seoul’s most fascinating and creative neighborhoods. 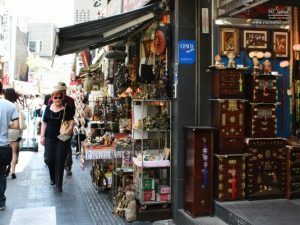 While the entertainment here is free, Insadong is also one of the best places in Seoul to purchase traditional Korean art, products, and other souvenirs, as it is filled with antique shops, art galleries, traditional stationery shops, handicraft shops, pottery and porcelain shops, bookstores, and art supply stores. Insadong is also home to many traditional restaurants and teahouses. 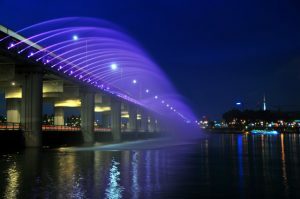 Just south of Seoul’s lifeline, the Han River, you’ll find the district of Gangam, which is one of the most bustling neighborhoods in Seoul in terms of entertainment. While there is a seemingly neverending amount of things to do for fun in Gangnam, I’ve picked out the best itinerary for you! So today we’ll take this course: ① Samseong-dong → ② Gangnam Station → ③ Garosu-gil (Garosu St.) in Sinsa-dong → ④ Cheongdam-dong → ⑤ Apgujeong-dong. There’ll be so much to eat and see, we’re going to have so much fun walking through these areas! 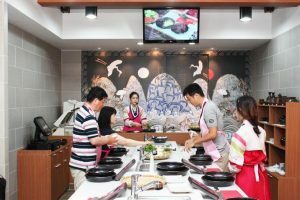 At the Kimchi Academy House, you can learn Korean history and culture through kimchi! It offers kimchi-making classes guided by a professional kimchi instructor. Participants can taste the kimchi they make, have it packed up, and take it home with them. People may also choose the option of learning how to make tteokbokki along with kimchi. Here, you can enjoy a soothing cup of tea with green tea rice cakes – the most popular rice cakes on the menu – in an elegant hanok (traditional Korean house). The museum also exhibits various implements traditionally used to make tea. Citizens Hall, which is newly named to refer to a space ‘for Seoulites, by Seoulites and of Seoulites’, is located in the first basement and second basement in Seoul City Hall. In particular, the name in Chinese characters carries the intention of listening carefully to Seoulites’ opinions. The spaces in Citizens Hall were planned with the purpose of ’emptiness’ and ‘flexibility’ which lead to extensive civil participation. The spaces are divided so as to be filled with civil participation in a variety of forms, such as exhibitions, performances, debates, rest, plays and so on. And also they were designed changeable in order to fit perfectly for each purpose when used. Bukchon Hanok Village sits between the two palaces of the Joseon Dynasty, Gyeongbokgung and Changdeokgung. 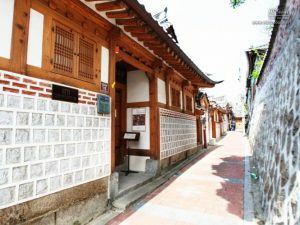 Unlike other hanok villages, Bukchon was not created for tourists but it is a living village inhabited by Seoulites, comprising about 900 hanoks spread across 11 dongs (administrative sections). The reason there are so many traditional houses in this area is that many yangbans (people from the ruling class) lived here during the Joseon Dynasty (1392-1910). 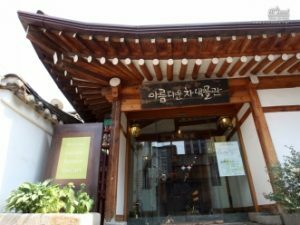 With its recently-opened hanok gallery, craft workshop and hanok restaurant, the village is increasingly important as a center for culture and the arts. There are also a number of museums of traditional Korean culture including the Gahoe Museum, the Han Sangsu Embroidery Museum, the Museum of Korean Art and many more. Gaon is an old Korean word that means “center” or “in the middle.” The Hangeul (Korean alphabet) Gaon Street is located in Jongno-gu district and is situated next to Gyeongbokgung Palace, where the Korean alphabet was created. The Hangeul Gaon Street is also home to the headquarters of the Korean Language Society and the site of Hangeul scholar and independence activist Ju Si-gyeong’s residence. The street begins at Sejong-daero (“daero” meaning “street” in Korean), which stretches from Gwanghwamun (Gate), past the statue of King Sejong the Great, and all the way to Sungnyemun (Gate). 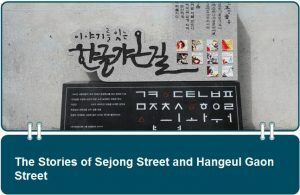 Let’s take a closer look at Hangeul Gaon Street, which filled with stories about Hangeul. From day to night, Seoul puts on a different face. The stoicism of the gray buildings during the day makes itself over with the glow of the neon lights as the sun goes down. In the darkness, the lights of the Han River illuminate the faces of Seoul’s citizens looking on from the piers. If Gangnam represents city life and city energy, then Gangbuk, with all its romanticism, is the elegant figure of two lovers walking away. The presence of the past holding hands with the present – this is the charm of Seoul’s night view. While New York gets credit as the city that never sleeps, to really experience a town that operates on a 24-hour basis, you’ve got to come to Seoul. The Korean capital is plenty exciting during the daylight hours, of course, but it really comes alive after sunset, when its streets and alleyways pulsate with an infectious energy. When night falls, Seoul is a place of endless possibilities. Perhaps unsurprisingly, then, Seoul is blessed with a fine nighttime cityscape, which can be enjoyed from a number of easily reached vantage points. 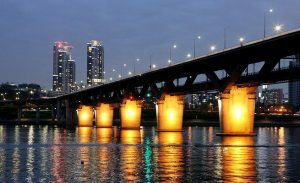 Some of the best views of the city at night can be had from along or even on the Hangang River, Seoul’s landmark waterway. This tour will take us to some of the best nighttime viewpoints in the city, both from above and from ground level. 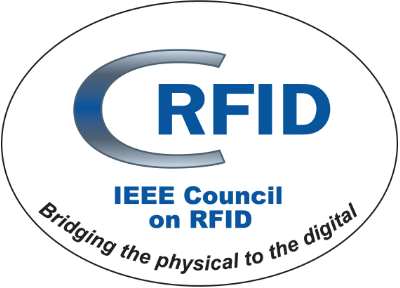 © 2019 IoT2015. All rights reserved. This website is hosted by the Università della Svizzera italiana (USI).